The top 15 game developers who can create an engaging mobile game offering you a source of income. These companies will effectively transform your game idea. 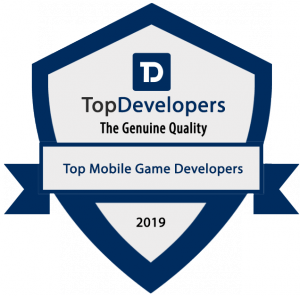 SAN FRANCISCO, CALIFORNIA, USA, January 12, 2019 /EINPresswire.com/ — Our unbiased analysis and research to find the top-rated game app development firms, has found these highly potential game app developers the most capable. The companies chosen here have been amazing the gamer with astoundingly interactive, attractive and thrilling games. Since game apps can have their owners earn in millions, many big businesses are now turning towards developing one. Mobile game can become a new business wherein your investment can earn you huge amounts in short period, if the game idea interests the right mix of audience. The firms are technically empowered and their mobile game app development teams are qualified and highly creative to bring any idea interestingly on screen that offers great user experiences. The AR and VR games are among the most loved ones of this century and the game development companies here can technically and graphically carve the illusions better. These mobile game development service providers have proven excellence in being creative, technically adept, cost effective, and in ideating better games. With their extensive experience in game creation, they can give your app idea an interesting game flow that will lure your target audience. Here, we have listed the 15 most efficient game app developers who are behind the popular games that you download on app stores. With all the aspects of a game idea being read and understood flawlessly, the companies here have creatively developed and offered wonderful game experiences for the users. They are positively reviewed and eventually show an impressive recommendation history from their former clients. Thus, after analyzing various factors that will advocate to the qualities of the skillful and reliable game developers, we have meticulously chosen these mobile game development agencies, who can build the most entertaining game for you with all the revenue generating strategies being implied. TopDevelopers.co is a leading directory for mobile app, web and software, and digital marketing service agencies. With an opportunity to understand and know the developers market worldwide, they research, analyze and choose among the best app development firms. TopDevelopers introduces the service providers to their seekers in order to find the best for the seekers needs.